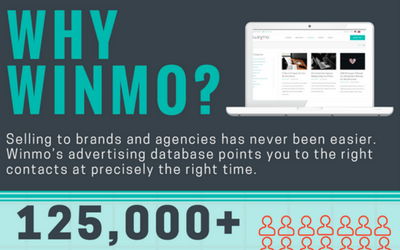 Wondering why Winmo is the right predictive sales intelligence platform for you? We’ve got your answers. If you’re looking for a smarter way to open doors with marketers, their agencies and the technologies they work with, we think Winmo could be the answer. As the industry’s leading sales intelligence platform, Winmo brings way more than just contacts to the table. Our advertising database gives you key decision-makers budget by budget, plus projected opportunity timelines, so you know when to pitch, who to talk to, and what to say.